Setting up your shipping is a far simpler process than you imagine it to be. With Magnet Commerce you can create your own custom shipping options according to shipping destination and weight or price. Alternatively, if your shipping origin is within the US or Canada, you can connect live with popular shipping companies for real time shipping cost calculation. Figure: Setup your Shipping Options by choosing "Setup > Shipping" in the Administration Panel. Before you add any data you will need to consider all of your shipping options, from land mail postal services to courier companies and find which one offers the best price package for your needs. All of these are dependent on weight. You entered weights for your products when you created the items in the catalog and this is where this information becomes important! Custom shipping: This mode allows you to create your own custom shipping options according to shipping destination and weight or price. Real Time Shipping: This allows you to connect live with popular shipping companies for automatic, real time calculation of the shipping cost: When an order is placed, your Magnet Commerce store will automatically transfer all relative information of an order to the shipping company(/companies) connected and get shipping cost information in real time. Please note that this option is valid only when shipping origin is within the USA or Canada! This mode is a most flexible way to create your own custom shipping options according to shipping destination and weight or price. Figure: Creating Custom Shipping Options. Name: Define a name for the shipping type you are creating: "Standard Mail", "Registered Mail" or "Special Delivery" are good suggestions for land mail services, or simply the name of the courier service. You want to aim for something that says exactly the type of service in no more than one or two words. Don't forget, the customer will see this name so capitalise the first letters to make a more appealing presentation. Countries: This is a very simple option to let you select countries that fall into the shipping 'band' you're creating. When a Shipping Option applies to more than one country you can group these countries together. An example of this would be a UK and Ireland only shipping for a UK Royal Mail service, or a courier service.
! If you select a country from this menu, your current shipping option will apply to all of the country's States by default. However, if specific states of that country are selected from the States menu (see below), your current shipping option will apply to those states only and not the whole country! In other words, in the case of ambiguity, the States field is more powerful than the Countries field. Don't forget, this option is very versatile! You can group together shipping destinations for Europe if you wanted UPS or DHL shipping, or you can set specific Shipping Options for an area in one country. This is only limited by how far you are prepared to ship merchandise. States: Certain countries are broken down into separate States. This applies especially to America, Canada, Greece, as well as the UK which is split into different counties. Some areas have higher shipping costs for remote locations; you need to check this with your shipping company. You can leave these settings at default in most cases, dependent on where you are based. The UK or USA should be fine left alone, but for the highlands of Scotland and certain remote islands like the Outer Hebrides a premium is added to the shipping costs. You would simply exclude these areas from the States list and create a separate shipping option for such locations. Figure: Excluding Aberdeen and Fife from the list of UK counties the option applies to.
! If you have already selected a country from the countries selection menu (see above), your current shipping option will still apply only to the States you have selected here and not the whole country! In other words, in the case of ambiguity, the States field is more powerful than the Countries field. Charge/Charges: You have two choices for shipping: either by weight (which is calculated on the weight you entered in: "Setup > General > Weight Unit" text box), or by a set predefined price. Both options are similar to set up so we will cover the weight option to guide you through it. Remember, the shipping is calculated on the total cost of the cart OR the total weight. You need to select "by weight" from the "Charge" drop down box and click "Update Setup". Then you can click the "Edit" button under the "Charges" heading. Your delivery service will offer you a weights and shipping costs leaflet as a guide if you ask them. Try to keep the charges as simple as possible and easy to understand. Your first option is a base weight, so you need to start at 0 lbs, or whatever weight method you use as defined in your setup/general options (Lbs is the default). In the following example the basic weight for the service is 0 to 0.5 and the shipping cost for this is $1.50. Once you have added both weights and the shipping cost, click on the Add button to add your first weight 'band'. Don't worry if the "0" is taken off the end at this point as this will cause no problems. The next weight 'band' is 0.5kg to 1.5kg costing $3.00. Note that you need to check that no weights cross over. If your first weight option ended at 0.5, your next one will start at 0.5. You carry this on until you have covered all the weights you deal with. Remember to click the Add button after each weight set and price is added, and when you are finished click the "Save & Close" option. The "by price" option means that instead of a weight basis of calculating shipping, you work on totals of goods ordered. So you could ship a $300 order for free, and orders of $25 or less could be set at $6.50 standard courier charge. This does make it simpler for you to deal with if you have large quantities of items per box you are shipping. If you know that the most common type of order is 5 packs of paper costing $25, you can ship that by land mail for $4.50, and another common order is ink cartridges costing $18 but the shipping is the same, then the by price option is an easier way to calculate shipping costs. If your orders vary so much that the weights are either very light or very heavy, then the weights option should be used. You need to see what products you have and what is commonly ordered to guide you in this decision. How to add a Custom Shipping Mode. To add a new custom shipping mode, simply type its name in the "Name" text box and click on the "Add" button. Figure: Adding a new Shipping type. The new mode will be added to your list of custom shipping options. You will then need to fill out all other fields (Countries, States, Charge, Charges) following the instructions and information provided above. 1. Add a name such as "Free Shipping over $50"
3. Set the "Charge" field to "by price"
4. Set 0 charge from 50 to a very high price value. 1. Add a name such as "Pickup from Store"
4. Edit the "Charges" field and set 0 charge for a range like 0-100000. If you choose this mode your e-store will communicate directly with FedEx, DHL and USPS and provide your customer with accurate, up-to-date shipping cost, according to the total weight of the order and the shipping destination. - This method is applicable only when your shipping origin is within the USA or Canada! This is the address from which your orders will be shipped. Figure: Defining the address from which the orders will be shipped. Country: Choose the country of origin from the drop down menu. Remember: the country of origin can be either the US or Canada! State: Choose the state of origin from the drop down menu. Zip: Define the zip code of the address of origin.
! This address, together with the shipping destination and the order's weight will be used by the shipping companies for calculating the shipping costs. Figure: Creating Real Time Shipping Options. Name: Choose the name of the shipping company and service you want to enable from the drop down menu. This will be added to your store's list of carriers. Countries: This is a very simple option to let you select countries that fall into the shipping 'band' you're creating. When a Shipping Option applies to more than one country you can group these countries together. An example of this would be a USA and Canada only shipping for a USPS service. Don't forget, this option is very versatile! You can group together shipping destinations for Europe if you wanted USPS or DHL shipping, or you can set specific Shipping Options for an area in one country. This is only limited by how far you are prepared to ship merchandise. Markup: The amount to add to (or remove from) the price of shipping. An example where this would be useful is adding an extra charge to cover packaging costs. This can be a set amount or a percentage of the shipping cost.
! All real time rates in Magnet Commerce are the same rates you would get from the shipping company's website (e.g. USPS.com). If you have negotiated for a lower rate than normal with one of these companies, Magnet Commerce will not return your discounted rates, as the shipping company's interfaces do not allow for this. In such a case please use a negative markup value. For example, if you get 10% off the normal rates for a service, set the respective markup value to -10. This only applies to shipping companies that provide merchants with public accounts, such as USPS or DHL. Magnet Commerce will return the discounted rates for companies using personal merchant accounts, such as FedEx. Markup is: Define whether the extra amount defined in Markup is a fixed value or a percent of the shipping cost. Restrict: Define whether the values in the "Low" and "High" text fields (see below) refer to an order's weight or price. Low: The shipping method will not be used only if the weight or price (measure chosen in the "Restrict" field) of an order is higher than the value set in this field. For example, the value in this field can be used for enabling a shipping mode with extra charge for heavy orders - see the first case under the examples section. High: The shipping method will not be used only if the weight or price (measure chosen in the "Restrict" field) of an order is lower than the value set in this field. For example, the value in this field can be used for enabling an economy shipping mode for orders up to a certain price - see the second case under the examples section. How to add a Real Time Shipping Mode. To enable a real time shipping mode to your Magnet Commerce store, simply choose it from the "Name" drop down menu and click on the "Add" button. Figure: Adding a new Real Time Shipping mode. The new mode will be added to your list of real time shipping options. You will then need to fill out all other fields (Countries, States, Markup, Markup is, Restrict, Low, High) following the instructions and information provided above. If you want to connect with FedEx you will first need to get a personal merchant account number. 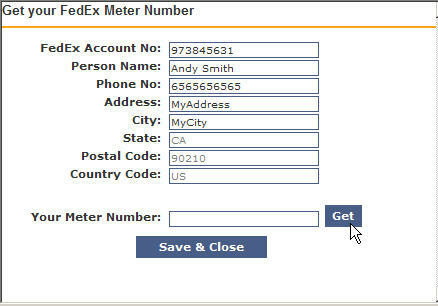 Figure: Provide a FedEx account and meter number for connecting live with the service. Meter Number: Your FedEx meter number: To get this click on "Create"
! You must have a FedEx account number before you can apply for a meter number! Figure: Getting a FedEx meter number. Type in your FedEx account and personal information and click on "Get". FedEx will provide you with a unique Meter Number on the spot. Click "Save and Close" to add your account and meter number. This process is only performed once. After that you will be able to offer Fedex real time shipping rates on your store! 2. Set the "Markup is" field to "percent"
3. Set the "Restrict" field to "by weight"
5. Set "High" to a very high value. 1. Set the "Name" field to "USPS - Economy (Surface) Parcel Post"
2. Set the "State" to "United States > NY"
3. Set the "Restrict" field to "by price"
5. Set "High" to 50. Figure: When you have finished setting up your shipping options click on the "Update Setup" button. When you have finished, click on the "Update Setup" button, at the bottom of the shipping page, to save all custom and real time shipping options you have setup!
! To view a newly added shipping mode on your store front, you will need to load your e-store on a new browser page! There are two shipping modes available: Custom Shipping, which allows you to create your own custom shipping options according to shipping destination and weight or price, and Real Time Shipping that allows you to connect live with popular shipping companies for automatic, real time calculation of the shipping cost. Assign a name to the shipping type you are creating and click add. Then select the countries or states where this type applies. Next set the costs according to the price or weight of the total order. You can use two or more methods to ship to one region: a standard service that's cheap but takes longer or a priority mail service that's faster and costs a little more. This lets your customers decide which service is better suited to their needs. You can define different shipping costs for the same type of shipping, e.g. one cost for shipping to your state, and one for all other states. Simply select your state only in the first option, and all others except yours in the second. That way two prices can be defined. To offer free shipping for orders over a certain amount add a new shipping type with a name such as "Free Shipping over $50" , select the areas that this applies to, select to charge by price and set zero charge from 50 to 100000. We suggest the amount to be slightly over your average sale. Don't forget to advertise this offer in your store! To offer a pickup from store option, add a new shipping type with a name such as "Pickup from Store", select the area of the store only, select to charge by price and set zero charge from 0 to 100000. But please be sure to allow plenty of time for you to have the goods ready for collection in good time. If you have multiple stores, you can ask your customer to choose one during checkout by adding a "checkout question" from the "marketing" tab. To enable a real time shipping mode, simply choose it from the "Name" drop down menu and click on the "Add" button. You will then need to define the countries/states and the price or weight range for which it will be enabled, and any extra charges you want to apply. You will also need to define the country, state and zip code of the address of origin. This address, together with the shipping destination and the order's weight will be used by the shipping companies for calculating the shipping costs. Real Time Shipping is valid only when shipping origin is within the USA or Canada! To work correctly, weight must be set for all you products and it must be in lbs! To apply a shipping method to selected states, do not add their respective country from the countries selection menu. To view a newly added shipping mode on your store front, you will need to open your e-store on a new browser! Before your store goes live you want to check all of your shipping rates, mistakes can eat into profits rapidly!! You have a quick calculation tool to check that everything is working correctly. Check everything carefully as it is best and simple to trace and fix mistakes early in the SetUp process. Magnetcommerce also allows the customer to see shipping charges early on in the ordering process by means of a quick calculation tool; this provides the critical information all customers need in a quick and straightforward way. This may sound obvious but it's an important point, check the spelling and capitalisation of your shipping descriptions. Mistakes look unprofessional and can easily deter a potential customer for life. The statistics are clear; a happy customer tells only 5% of people of a good store, an unhappy customer tells 95% of people of problems and mistakes. Check and double check everything carefully. Remember if you make a mistake, click the button relating to the section and read through it slowly to find the problem. When you have found it, highlight it, change it and click the save button to amend the changes. If you have any problems please feel free to contact us for some additional expert help.